Acne is the term for plugged pores (blackheads and whiteheads), pimples, and even deeper lumps (cysts or nodules) that occur on the face, neck, chest, back, shoulders and even the upper arms. Acne is prevalent in teenagers and affects most teens to some extent. However, acne can affect any age group, including adults in their 20’s – 40’s. For some people, acne will clear up after several years, but for others, acne is a lifelong disease that requires continued maintenance. If you have acne that is bothersome and makes you unhappy about your appearance, you can do something about it. There are many options for treatment depending on the type of acne you have. Untreated acne can leave lifelong scars. Acne is considered a skin disease, so while it is not a life threatening condition, acne can be upsetting and disfiguring. Severe acne can lead to serious and permanent scarring. Mild and moderate acne cases can lead to scarring as well. Acne is not caused by dirt. The black in a blackhead is dried oil and shed skin cells in the openings of the hair follicles, not dirt. For the normal care of your skin, wash your face with soap and warm water twice a day. Washing too often may actually make your acne worse. Regular shampooing is also recommended. If your hair is oily, you may want to wash it more often. Your can recommend the best face and hair washing routine. The Medispa Institute has excellent medical grade acne skin care products that can help to manage and reduce acne outbreaks. Acne is not caused by the foods you eat. s have differing opinions on the importance of diets in the management of acne. One thing is certain, a strict diet by itself will not clear your skin. On the other hand, some people find that certain foods seem to make their acne worse. Some people report anecdotally that foods such as coffee, spicy foods, fried foods, and chocolate make their acne worse. If that's the case, foods that clearly worsen your acne should be avoided. But be careful about jumping to conclusions, acne has many ups and downs on its own. A tan can mask your acne, but the benefits are temporary. Since sunlight ages the skin and can cause skin cancer, you should not sunburn, "bake in the sun" or use sunlamps. Choose a sunscreen that is oil-free, such as a gel sunscreen or one that is clearly marked “oil-free.” The Medispa Institute has a wide range of sunscreens from which to choose. Don’t skimp on sunscreen for your face, it may be a bit more expensive but it’s worth it when you’re putting it on your face. If you wear a liquid foundation or use a moisturizer, look for ones that are oil-free and not just water-based. Choose products that are "non-comedogenic" (should not cause whiteheads or blackheads) or "non-acnegenic" (should not cause acne). Remove your cosmetics every night with soap and water. A fresh-tinted acne lotion can safely hide blemishes. Loose powder mixed with oil-free product is also good for cover-up. Shield your face when applying hairsprays and gels. If the spray comes in contact with your facial skin, it can cause a cosmetic type of acne. If you have acne on your forehead, keep bangs and hair off your forehead. Recently, it has been shown that mineral makeups are excellent for acne skin. Since they are mineral powders, they do not contain many of the oils and preservatives that can irritate acne. Mineral makeups are natural, oil free, and contain sunscreens. The Medispa Institute has a complete line of mineral makeup, including loose powder, powder foundation, blush and eye shadow that you can choose. Ask a sales associate to help select the perfect makeup for you. The treatment your recommends will vary according to your type of acne. Occasionally, an acne-like rash can be due to another cause - such as makeup or lotions you've used or oral medication. Rarely acne can be due to a hormone imbalance. It's important to help your dermatologist by providing a history of what you are using on your skin or taking internally. Women will want to discuss changes in the menstrual pattern. Your may prescribe topical creams or lotions such as vitamin A acid or benzoyl peroxide to help unblock the pores and reduce the bacteria. These may cause some drying and peeling. Your skin specialist will advise you on the correct use and how to handle side effects. 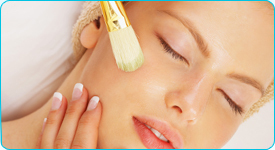 Your skin specialist may open pimples or remove blackheads and whiteheads. Don't pick, scratch, pop or squeeze pimples yourself. When the pimples are squeezed, more redness, swelling, inflammation and scarring may result. Antibiotics taken by mouth such as tetracycline, minocycline or erythromycin are often prescribed for moderate or severe cases, especially when there is a lot of acne on the back or chest. The antibiotics reduce the bacteria in the follicle and may also decrease the redness directly. When taking oral antibiotics some women develop a yeast infection in the vaginal area. If this occurs, continue your medicine and contact your dermatologist immediately for treatment of the yeast. In cases of severe acne, other drugs may be used orally. These may include female hormones or medications that decrease the effects of male hormones. Another oral medication, isotretinoin, more popularly known as Accutane, is sometimes used for severe acne that has not responded to other treatments. Patients using isotretinoin must thoroughly understand the side effects of this drug. Frequent follow-up visits are necessary to monitor side effects. Prevention of pregnancy is a must, since the drug causes severe birth defects if taken during pregnancy. There are new methods to treat acne that include laser and photodynamic therapy for people who do not want to take antibiotics or who have not shown improvement with oral drugs. Ask your skin specialist for more details on these new treatment methods. No matter what special treatments your skin specialist may use, remember that you must continue proper skin care until the tendency to have acne has passed. There is no instant or permanent cure for acne, but it is controllable and proper treatment may prevent scars.